Annoor Jami Mosque, Zawiya Fellowship is pleased to announce the grand opening of our brand new online bookstore! 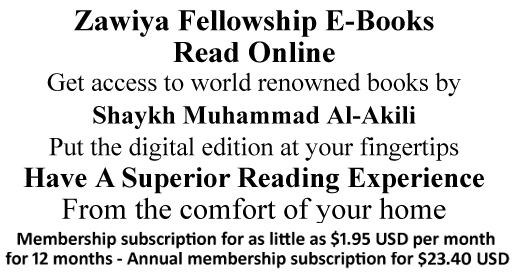 You can now have access to world renowned e-books by Shaykh Muhammad Al-Akili at your fingertips. To access please create an online account. You can view all available books in our library. Once an account is created, you will be able to access the bookstore and have the option of purchasing an online membership subscription of your choice with a valid credit card or PayPal account.